Our world, and California specifically, is increasingly becoming more and more concerned with finding sustainable and greener ways to get energy. So what’s the solution? For many homeowners, the top answer is solar panels. If you have considered investing in solar panels for your home, you probably have a few unanswered questions. 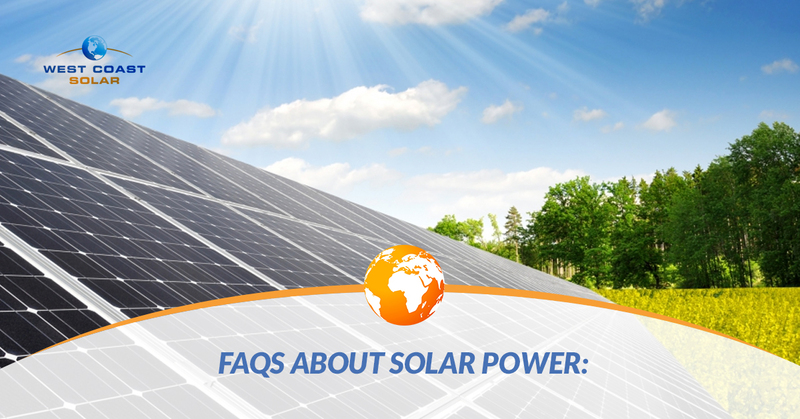 Today, we are going to cover some of the most commonly asked questions we hear about solar power and what to expect. Read on to learn more, then call the professionals at West Coast Solar, Inc. to get started now! Are there any financial benefits of choosing solar panels? Yes, there are many! The upfront costs might give a few people sticker shock, but we urge you to do your research past this. When you implement a solar power system in your home, you save money on electricity bills and prevent your home from being affected by changing rates in the future. How much you save depends mostly on the price of utilities in your area, as well as the solar policies, but solar power is an incredible investment anywhere in the world. While solar power lessens our carbon footprint, it has many other environmental benefits. In fact, switching to solar can reduce our greenhouse gas emissions and lessen the air pollutants that are released into the air each and every day. This is specifically the case for sulfur dioxide and particulate matter, which can lead to health problems. Net metering is a system that allows your solar electricity to be credited towards your utilities. This means that you will only need to pay for the electricity that you use past what your solar panels generate. Of course, net meter policies do vary depending on where you live, so make sure to brush up on California’s net metering regulations and rules. Can solar power affect the value of my property? Homes with solar energy sell for much more than those homes without them. And, if you are looking to increase your investment in your property more, it helps to own the solar panel system. In many parts of the country, switching to solar power will increase the value of your property more than a kitchen renovation would. Your new solar panels will absorb energy from the sun throughout the day and convert it into direct current electricity (also called DC). Most homes fun on alternating current electricity, so the DC is sent through an inverter to change it into AC electricity. Once that’s complete, you either use the new energy, or it gets sent back to the electric grid. Can solar panels work even when it’s cloudy outside? The amount of power your system creates depends on sunlight, which means that cloudy weather will affect how much is produced. There will be no energy produced at night. However, even if you live in a cloudy area, there are still quite a few financial reasons to choose solar power. For those of us in sunny California, we live in one of the best places to choose solar! Could I go off grid with my solar panel installation? Technically, no. When you install solar panels, you are still connected to the grid. This is a good thing, as it means your home can draw energy from the grid that it may need if your system has not collected enough solar power. If you would like to go off of the grid, this is possible. You will just need to choose a battery storage option for your home. We can help with that! Would I still get electricity bills with solar panels? Unless you choose to implement batter storage in your home and you fully remove yourself from the grid, then you will still receive a bill from your utility company. However, you can lower your bill or even cut the total to $0 with a solar panel system that matches how much electricity you use! Do solar panels work when the power goes out? If your solar panel is connected to the grid, then it will shut off during a blackout. This is strictly because of safety; emergency responders and electricity repairmen can become injury by panel sending power back to the grid otherwise. However, you can invest in an inverter that will provide backup power in case of a blackout when it is paired with a battery. All solar panel systems are made of extremely durable materials, including tempered glass. This means that they need little to no maintenance during their 25 to 35-year lifespan. In fact, most people don’t even need to clean their solar panels that frequently. If something does happen, many manufacturers include warranties, so be sure to discuss those terms when you choose your solar panel company. If you are interested in taking the plunge from standard electricity to solar power and helping reduce your impact on the world, it’s time to contact us today. We look forward to taking a look at your home and seeing how we can help you make the transition. Our team of professionals can handle the entire solar installation with no subcontractors whatsoever. We handle all the permit acquisitions, and we do the coordinating work with your electric company. See what sets our team apart by calling us today!